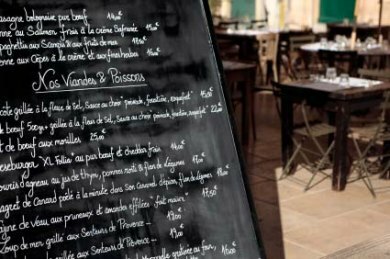 If your knowledge of French food is limited to French fries and French toast, here's a primer on some of the popular French dishes served in bistros and cafés right here in the United States. Julia Child might have popularized French food in the United States, but the complex cuisine is forever reinventing itself. Francophiles probably have no problem navigating bistro menus full of mignonettes and cocottes, but if your knowledge of French food is limited to French fries and French toast, you could probably use a primer on some of the popular French dishes served in bistros and cafés right here in the United States. Sauce gribiche is a mayonnaise-style cold sauce made by emulsifying hard-boiled egg yolks and mustard with a neutral oil, such as grapeseed or canola oil. The sauce is typically finished with cornichons, capers, parsley, chervil, chives, and tarragon. You’ll see this on French restaurant menus as a dipping sauce, salad dressing, or sandwich spread, but it’s occasionally served with boiled chicken or fish to dress up the flavor. Use it to add some zip to your next cold potato salad or as a steak sauce. When you see the term “de Bourgogne” on a French menu, it typically means “with garlic and butter.” Garlic butter is a popular cooking and serving method in French cuisine so it’s likely that you’ll see these words on everything from meat and poultry menu descriptions to the wrappers of your favorite seasoned French cheeses. French food has a reputation for being heavy and rich, but if you see “beurre blanc” sauce on a menu, you’ll know that you’re ordering one of the more simply prepared dishes. Commonly seen attached to white fish and other seafood, “beurre blanc” literally translates to “white butter.” It’s a hot, simple sauce made with a reduction vinegar, white wine, shallots, butter, and sometimes lemon juice or zest. Geography lesson: beurre blanc is said to have originated in the cuisine of the French Loire Valley. Typically served alongside oysters or other seafood dishes, mignonette sauce is a classic vinaigrette made with minced shallots, cracked black pepper and vinegar. The name “mignonette” originally referred to a bundle of peppercorns and baking spices used to flavor dishes, but now simply translates to “cracked pepper.” Though different mignonette sauces use different types of vinegar—many include champagne vinegar—all sauces include pepper.